Today’s ballet class structure evolved through history absorbing traditions, movement practices, and dance science. Ballet uses several languages with which you must become proficient. To perform a second port de bras, begin in preparatory position, or fifth position en bas. The barre exercises presented in this chapter follow the order in which they are performed in the traditional ballet barre. Beginning Ballet and the accompanying web resource introduce students to the study of ballet as a performing art and provide instructional support in learning foundational ballet technique. Part of Human Kinetics’ Interactive Dance Series, Beginning Ballet is for students enrolled in a beginning ballet class at the college, university, or high school level. The book features more than 80 photos and concise descriptions covering basic foot and arm positions, barre exercises, and centre combinations. Beginning Ballet introduces students to the structure of a ballet class, including expectations, etiquette, and attire. Students also learn how to prepare for class, maintain proper nutrition and hydration, and avoid injury. This text outlines the unique history of ballet from its beginnings in the Renaissance to the 21st century and discusses the styles, aesthetics, artists, and significant works that have shaped ballet as a performing art. In addition, the accompanying web resource presents more than 70 instructional video clips and 50 photos to help students learn and practice beginning ballet. The web resource also includes an interactive quiz, audio clips of ballet terms with pronunciation in French, and assignments. The quiz covers vocabulary of beginning ballet, definitions, and translation to and from the French language. Ballet class provides the foundation for learning the dance form, and Beginning Ballet supports that learning through visual, verbal, and interactive instructional tools. Beginning Ballet text and web resource help bring the grace, artistry, and mental and physical benefits of ballet to students. Beginning Ballet is a part of Human Kinetics’ Interactive Dance Series. The series includes resources for modern dance, ballet, and tap dance that support introductory dance technique courses taught through dance, physical education, and fine arts departments. Each student-friendly text includes a web resource offering video clips of dance instruction, assignments, and activities. The Interactive Dance Series offers students a guide to learning, performing, and viewing dance. 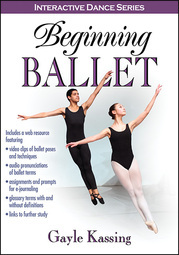 Textbook for undergraduate beginning ballet courses in dance, fine arts, physical education, and general education programs. Textbook for advanced high school dance programs. Gayle Kassing, PhD, taught beginning ballet through advanced ballet for more than 25 years at four universities. Kassing earned a BFA in ballet and theater, an MS in modern dance, a PhD in dance and related arts, and an MAT in K-12 curriculum integrated with technology. She was the 2010 National Dance Association (NDA) Artist Scholar. She is a member of the National Dance Education Organization (NDEO). She is the author of History of Dance and coauthor of Teaching Beginning Ballet Technique. Kassing is an acquisitions editor at Human Kinetics. Beginning Ballet Web Resource offers more than 70 video clips of ballet instruction plus photos to support acquisition of ballet technique. This online tool also includes assignments, success checks, audio clips of ballet terms with pronunciation in French, and a comprehensive quiz. The quiz covers beginning ballet vocabulary, definitions, and translation to and from the French language. Created for university, college, or high school learning environments, the web resource offers interactive instruction to support students in learning to perform, understand, and appreciate ballet as a performing art.